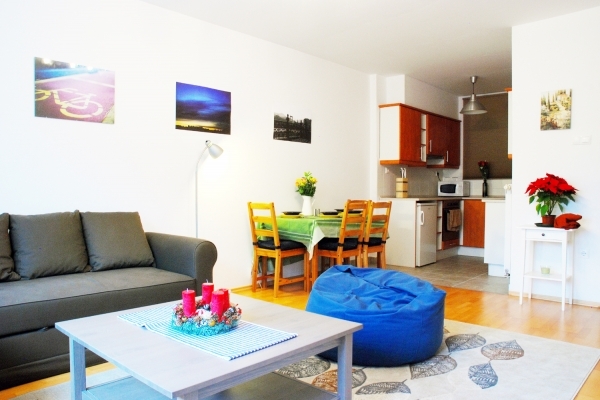 Our bright and spacious two-room apartment is located in the heart of Budapest, on Akacfa buzz (Acacia) Street. It can accommodate up to 4 people on 50 square meters. This is the most beautiful part of Budapest, in a historic district surrounded by so-called ruin pub, restaurantsand trendy bars. This is a newly built house, which offers a large living space with a modern design and comfortable furnishings. You have easy access to all services, as the best pubs and bars, restaurants, grocery stores and everything you need for a perfect holiday. We welcome all the guests coming in and share our best advice on Budapest with them. We also offer our favorite restaurants, bathrooms and activities in the city. We like the area because it is within walking distance of all the attractions and is right in the middle of the bustling scene, cultural and artistic Budapest. There is a metro station 5 minutes, heaps of night buses / bus stop nearby. There is a tram that takes you around the city center. It is a busy area, but the windows are well insulated, so you do not hear the noise from the street. Our spacious and bright one bedroom apartment is located in the heart of Budapest, on the buzzing Akacfa (Acacia) Street. It accommodates up to 4 people on 50 sqm. This is the coolest part of Budapest in a historic district surrounded with the so called ruin pubs, trendy restaurantsand bars. This is a newly built house offering a spacious living space with modern design and comfortable furniture. You have easy access to all amenities such as the best pubs and bars, finest restaurants, grocery shops and everything what you need for a perfect holiday. We welcome all guests on arrival and share our best tips about Budapest with them. We also offer our favorite restaurants, bathes and activities in town. We love the area because it is within walking distance to all sights and it is right in the middle of the buzzing, cultural and art scene of Budapest. There is a Metro station 5 minutes away, heaps of buses/night buses stop near by. There is a tram which takes you around the city center. It is a busy area, but the windows are well insulated, so you won't hear any noise from the street.